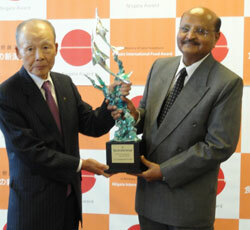 Mr Hajime Koizumi (left), Chairman of the Foundation. Hyderabad, India (30 October 2014) – Dr CL Laxmipathi Gowda, Deputy Director General for Research of the International Crops Research Institute for the Semi-Arid Tropics (ICRISAT), received the 2014 Sano Touzaburo Special Prize from Japan’s Niigata International Food Award Foundation, at yesterday’s award ceremony held in Toki Messe International Conference Hall, Niigata, Japan. The prestigious award is in recognition of Dr Gowda’s contributions in improving the livelihoods of smallholder farmers in the dryland areas of Asia and sub-Saharan Africa in his nearly 40 years of scientific research work at ICRISAT. “I am delighted to receive this award towards the completion of my four decades of career with ICRISAT serving smallholder farmers in the drylands, and I am taking this opportunity to re-dedicate myself to help them in their fight against poverty and hunger,” said Dr Gowda in accepting the award. The Niigata International Food Awards, considered as Asia’s version of the World Food Prize, honor outstanding individuals whose achievements greatly contribute to the peace and well-being of the world by improving the supply of quality food, or by improving peoples’ understanding of the role food plays in their health. Dr Gowda is known for his significant contribution in developing improved chickpea (both desi and kabuli) cultivars with high yield and resistance to diseases and pests. Shared as international public goods (IPGs) with scientists and national programs globally, 70 high-yielding chickpea cultivars from these improved breeding lines have been selected, tested and released in 30 countries globally. Several of these chickpea cultivars have had significant impacts in smallholder farmers’ fields, and have contributed in the attainment of national food security and increased farmers’ incomes in many developing countries like Myanmar, Sudan, Ethiopia, and Tanzania. The adoption of improved chickpea cultivars from ICRISAT-bred lines has resulted in more than 80% chickpea area covered with improved varieties in the state of Andhra Pradesh, India. In the last decade the area has increased four-fold and production nine-fold, due to the nearly three-fold increase in yield per hectare. Dr Gowda is also known internationally, particularly in ICRISAT’s focus regions (Asia, West and Central Africa, and East and Southern Africa) for his nurturing, scientific leadership in the areas of breeding, pathology, entomology, and physiology. As Coordinator of the Cereals and Legumes Asia Network (CLAN), he has been assisting and guiding national legumes improvement programs in Bangladesh, Indonesia, Nepal, Vietnam, and Thailand. He is an International Member of the Chinese National Groundnut Research Committee, and International Adviser to the Peanut Research Institute, Qingdao, China. He is also in the advisory bodies of some seed companies in India. Dr Gowda is one of the main architects of the Hybrid Parents Research Consortium (HPRC), ICRISAT’s flagship public-private partnership (PPP) program with private sector seed companies. HPRC is now a model for PPP in other international research centers. The consortium capitalizes on the private sectors’ ability to produce and market hybrid seed, making those available and affordable to smallholder farmers. Dr Gowda completed his BSc (Agriculture) from the College of Agriculture, Dharwad, University of Agriculture Sciences, Bengaluru; his MSc (Agriculture) from the GB Pant University of Agriculture and Technology, Pantnagar; and his PhD from the Indian Agriculture Research Institute, New Delhi, India. He joined ICRISAT in 1975 as a chickpea breeder, and rose to the position of Deputy Director General for Research. He has published more than 230 journal articles and conference papers, and over 80 books and book chapters; Editor-in-Chief of the e-Journal of SAT Agriculture Research and Asian Agri-History Foundation; and serves in the Editorial Boards of the International Journal of Plant Protection, Journal of Food Security, and Journal of Crop Science and Biotechnology.